The Girihanduseya temple at Thiriyaya is considered unique as it is supposed to be the oldest Buddhist temple in Sri Lanka enshrined with the hair relic of the Buddha. According to Buddhist annals two trader brothers Thapassu and Bhallika offered the first `dana' to the Buddha on the 50th day of His attaining Buddhahood. The Buddha delivered an anusasana and having come to know that the glorious personality to whom they offered alms was the Buddha himself, they requested him for something for them to worship. The Buddha offered them a lock of hair from his head. The jubilant trader brothers placed the hair relic in a golden casket and carried it with reverence wherever they went. Soon they set sail with a large consignment of cargo and having arrived in Lanka they anchored at Galwaraya now known as Kallarawa. The people lived there were `yakka'. The two brothers who met their chieftain spent the night on a hilltop where they placed the golden casket on a small rock and covered it with a white cloth. The next morning to their astonishment they found that the golden casket was embedded to the rock. All attempts to retrieve the casket failed and they left the place having covered the casket with a piece of rock for safety. The `yakka' chieftain who came to know about the Buddha began to worship the relic. Later he became a follower of the Buddha. Legend has it that king Wasaba (67AD) built the original stupa and also an irrigation tank which is known as Thiriyaya tank. 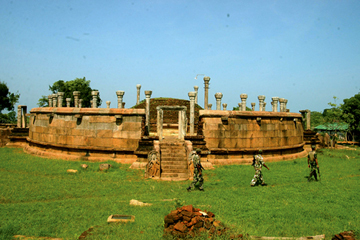 King Pandukabhaya and king Devanampiyatissa also venerated this `stupa' till 412 AD, it is claimed. The Girihanduseya is also known as `Neethupatpana' a `Pali' word meaning rock visited by trade leaders. King Agrabodhi Seelamega (733AD) built a bigger chetiya over the small one. Later foreign invasions followed and the people had to seek refuge elsewhere. The overpowering forest began to set in leaving the chetiya at the mercy of the elements. It is believed that king Agbo (VI) (772AD) who stationed himself on the hilltop with an army completed the granite work and also built the `Watadage'. The area became once again populated with the native Sinhala Buddhists but who too had to leave the area due to constant enemy conquest. Once again the temple fell victim to the thick jungle.It was however in 1929 that a group of surveyors discovered the Chetiya and observed several stone inscriptions. The inscriptions bore testimony to the true identity of Girihanduseya where Buddha relics were enshrined. Later the archaeological department investigations examined the site and confirmed it to be that of Girihanduseya via a gazette notification in 1930. Due to the persuasion of the late D.S. Senanayake the late Dr. Senarath Paranavithana carried out the restoration work of the `chetiya' and the `watadage' in 1951-1952. Subsequently with ethnic violence reaching its peak the Sinhala population living in that area along with the priest left the area in 1982. For nearly twenty years the area remained under LTTE control. Except for the newly built `Sangavasa', pilgrims rest and such other buildings none of the ancient structures were damaged. The Sri Lanka Navy which took over the security in the area facilitated the inflow of pilgrims once again.